This year's men's Royal Rumble match was won by Seth Rollins, who chose to face Universal Champion Brock Lesnar in one of the main-events of WrestleMania. 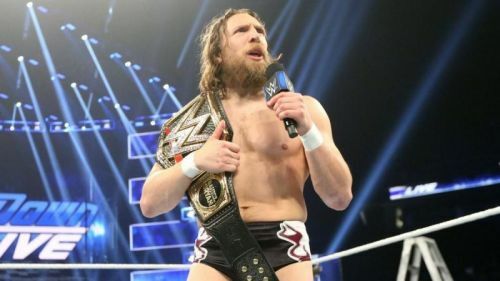 Furthermore, The Elimination Chamber will see Daniel Bryan defend his coveted WWE title against Randy Orton, Kofi Kingston, Jeff Hardy, Samoa Joe, and AJ Styles. This was a very perplexing decision on WWE's part, as we are a few weeks away from WrestleMania and fans don't have a clue about who's going to challenge for sports entertainment's most prestigious title at the grandest stage of them all. Given that WWE has such a razor-thin roster on SmackDown Live, Daniel Bryan doesn't have many credible challengers left on the blue brand. As Bryan is a heel, WWE would be wise to choose a babyface as his next challenger. However, there are only two deserving challengers for Bryan - Rey Mysterio and Bray Wyatt. Bray Wyatt has been conspicuously missing from WWE since last August and he has fallen down the pecking order to the point that a WWE title opportunity seems virtually impossible, which means that Rey Mysterio is the best (and probably the only) challenger for Bryan's WWE title. Mysterio Vs Bryan is a blockbuster dream match that has money written all over it, and fans would love to see two of wrestling's finest go head to head for the most coveted prize in WWE. Fans have been longing for this dream match ever since Bryan returned from retirement, Mysterio's return last October fueled rumors of an impending showdown between the two. Mysterio is one of the only opponents Bryan hasn't had a rivalry with, which is appalling considering that they have been on the same roster for months. WWE is probably saving this mega-match for a huge occasion, and it doesn't get any bigger than WrestleMania. Bryan has faced Styles a handful of times, Jeff Hardy's nearing the end of his career and it doesn't look as if WWE has huge plans in store for him, Mustafa Ali is just too new and his injury has put him out of commission, Rusev has always been seen as a mid-carder, and the rest of SmackDown's upper-card which includes the likes of Randy Orton and Samoa Joe, consists of heels. This leaves Mysterio as the best option for Bryan. Daniel Bryan Vs Rey Mysterio would be a phenomenal contest, and the bright lights of WrestleMania will make it a true spectacle. What do you think of Bryan Vs Mysterio at WrestleMania? Leave your opinion in the comments!